The opportunity for students to explore, learn and grow doesn’t exist strictly between the day’s school bells. Before class, after class and summertime are important periods for DC youth to engage in educational and enriching activities, too. These vulnerable hours are key to providing students every opportunity to express themselves to the world, to be inspired and to gain critical life skills that will set them on a path to healthy, successful lives. Research shows participation in afterschool and summertime programs leads to improved academic performance and social skills, as well as better health and well-being. Sadly, and all too frequently, students with the greatest need for enrichment programs outside of the typical school day are the least likely to have access to them. The challenge: How do we provide all students equitable access to such programs outside of the school day—regardless of their socio-economic status or where they live in the city? The solution: Student-centered, youth development organizations like Sitar Arts Center. Sitar exemplifies how effective investments in arts programs make a difference in the lives of children and their communities. 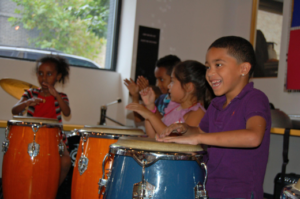 Sitar creates a sense of belonging and community, providing more than 900 children and teens (80 percent of whom are from lower-income families) year-round access to transformative, high-quality visual, performing and digital arts programs. 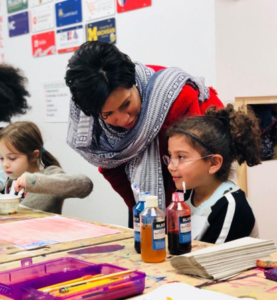 That’s why Mayor Muriel Bowser visited Sitar on February 5, during Education Week in Washington, DC, for the launch of Learn24, a new initiative geared toward helping ensure all local children have access to quality activities beyond the school day. The initiative includes the new Office of Out of School Time Grants and Youth Outcomes, which will award $2 million in grants annually to 40 organizations, including Sitar, serving more than 23,000 children in Washington, DC. Joining Mayor Bowser at the press conference were Jennifer Niles, Deputy Mayor for Education and Maureen Dwyer, Executive Director of Sitar Arts Center. But, the star of the press conference was 10-year old Sitar student, Daniela Carrillo. Daniela spoke eloquently of her years at Sitar and of how it has enabled her to find her true passion. “It’s better to be at Sitar than at home watching TV”, Daniela said. “Because TV will always be there, but missing a day at Sitar can never be replaced.” With these words, Daniela put the impact of Sitar’s community into perspective for all to witness. 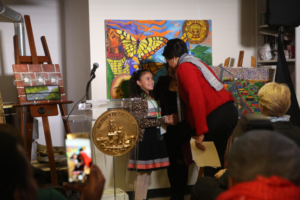 Daniella then had the honor of welcoming Mayor Bowser to speak. Again, displaying her confidence in a moment that could make anyone nervous, this exceptional young lady was at ease bringing the Mayor of the nation’s capital to the podium. 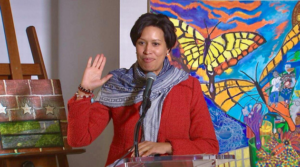 In her remarks, Mayor Bowser also declared her admiration for Sitar’s focus on the arts. Referring to arts as more than an add-on, a fun thing to do in addition to academics, she noted how the arts contribute to a student’s ability to learn, and how a focus on students’ creativity and imagination translate to success both in and out of the classroom. After the press conference, Mayor Bowser visited with students and classes at Sitar Arts Center. She witnessed firsthand Sitar students creating, performing, and learning outside of regular school hours.